As you first walk in the door, you are greeted with a large black and white picture of my daughter, Lundyn, from a fashion photo shoot we did in downtown Portland. 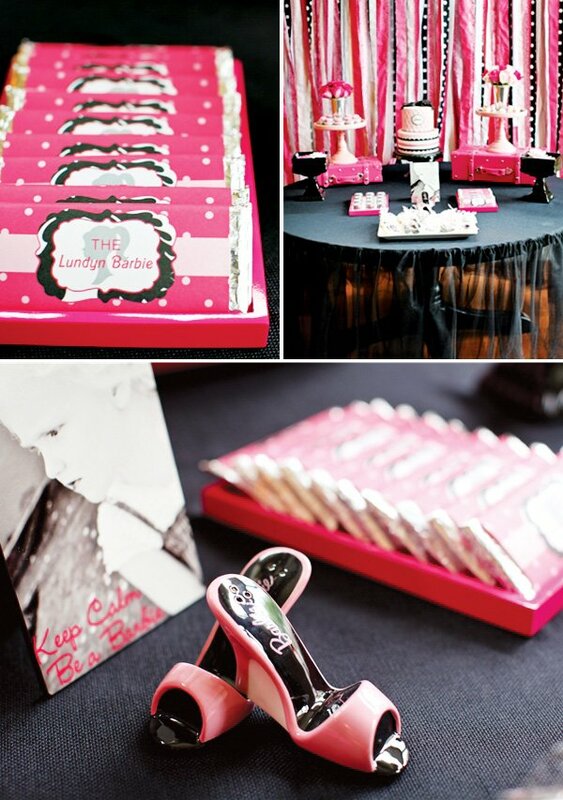 The picture included the words “THE Lundyn Barbie” written in Barbie pink at the bottom of the picture. Below this was a runway I created using a record player. I knew I wanted to somehow incorporate a moving runway, and this turned out to be the perfect solution! I covered the base of the runway with a ribbon skirt and then weighted down the records so it wouldn’t be too fast. 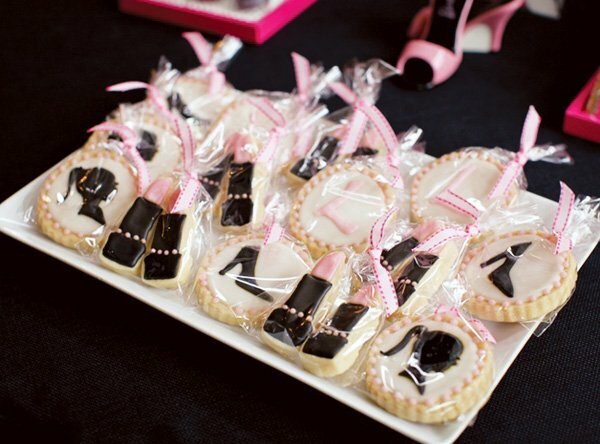 I placed three of the fashion Barbie’s on top and away they went, “strutting down the runway,” it was seamless! What’s a fashion show, without a runway, right?! 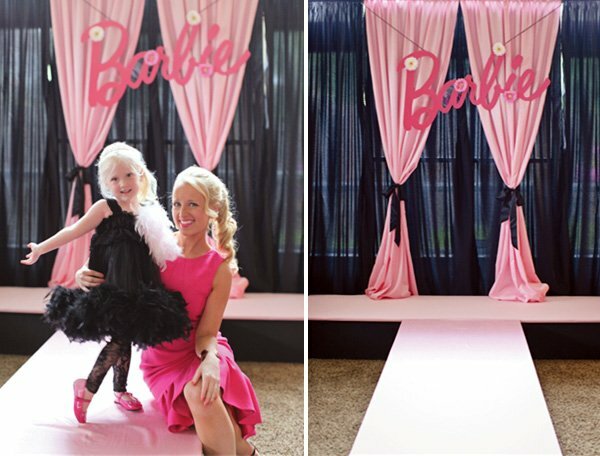 With the help of my very talented husband, we created and built a t-shaped runway out of wood, painted the sides of it black and then covered the top with pink fabric. 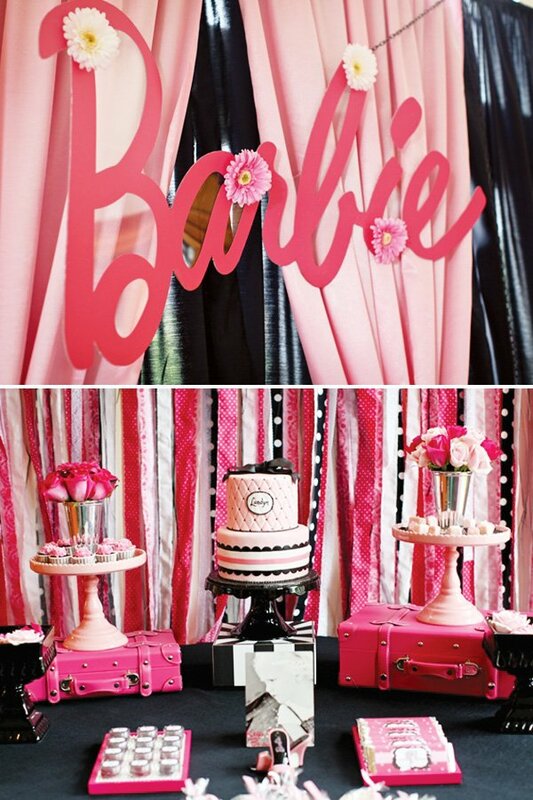 I created and designed a very large pink Barbie sign and in the back of the runway, I draped pink and black fabric panels for the backdrop and hung the Barbie sign in the middle. 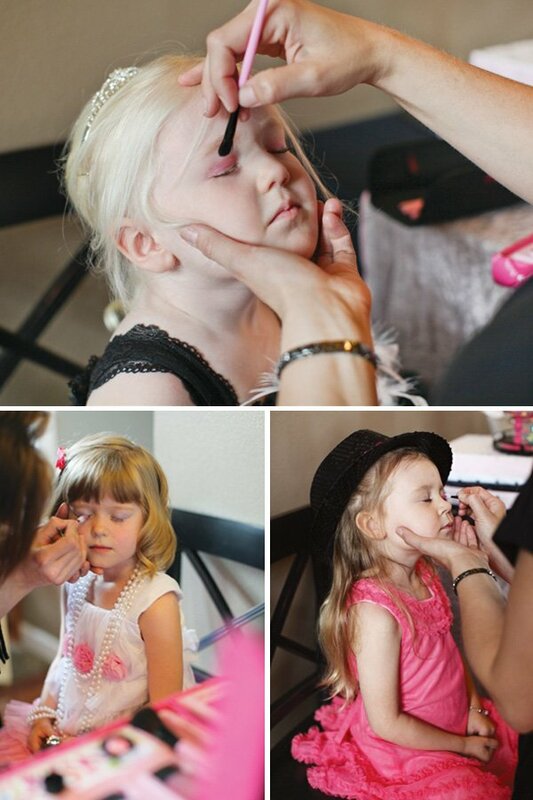 After everyone was ready, we had a fashion show for all the little guests to strut their stuff down the runway! 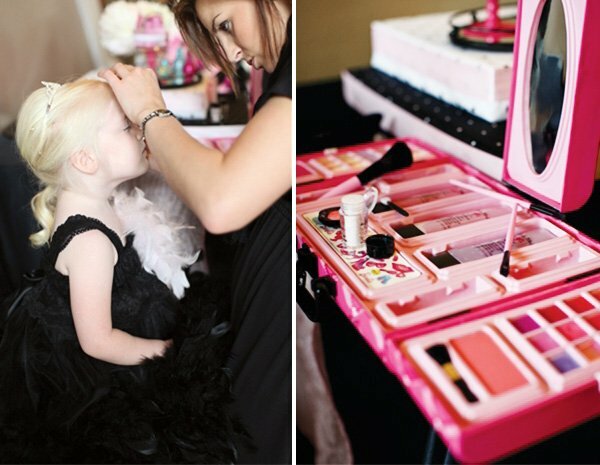 From there, each guest received a mini makeover that included Barbie eye shadow, lipstick, blush and perfume. I knew I wanted a dress up area that was easily accessible for the girls to pick out what they wanted to wear, and I thought something that twirled around, similar to a lazysusan, would be perfect! 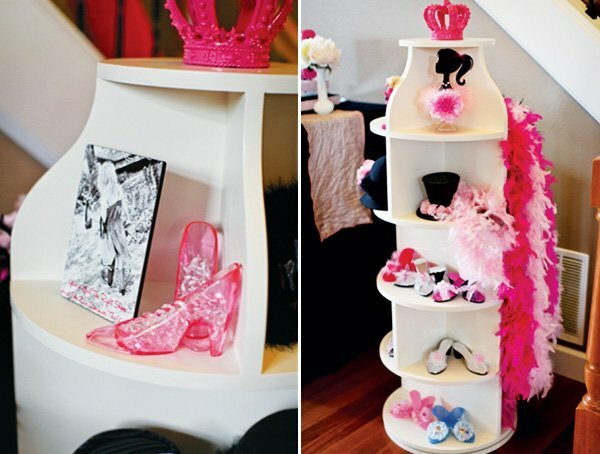 I wanted the piece to incorporate shelves to hold their little high heeled shoes and hats and also a bar that I could hang their feather boas and wraps on. With this idea in mind, I had my very talented brother create and build exactly what I had pictured in my mind, the PERFECT lazysusan dress up station, complete with shelves, a hanging bar and the best part of all, it twirled! Perfection! I also included another fashion area that housed all of the jewelry accessories, such as long pearl necklaces, bracelets, rings and gloves. Above this area I hung my daughter’s name that I made out of foam and wood letters and I covered the foam letters with candy. 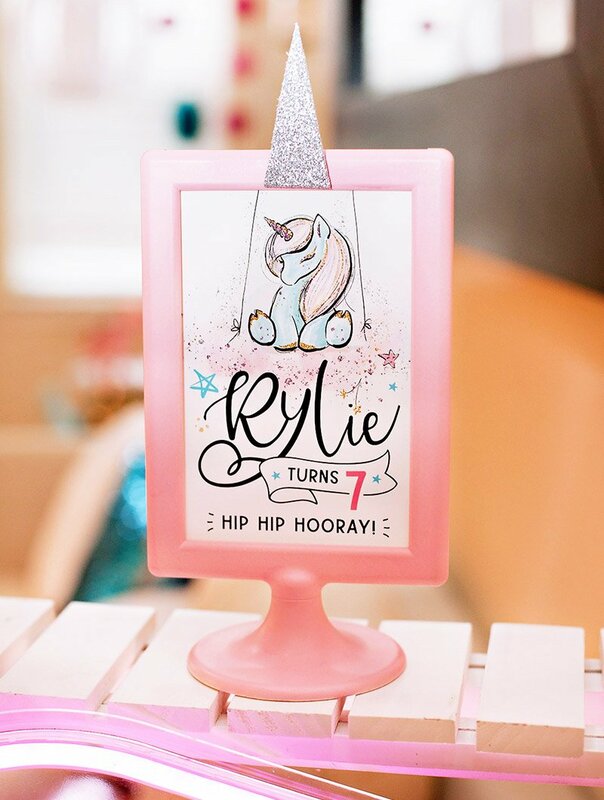 I had placed photo plaques around the party of pictures from my daughter’s photo shoot, and each included Barbie quotes at the bottom. What little girl doesn’t LOVE to have their photo taken?! 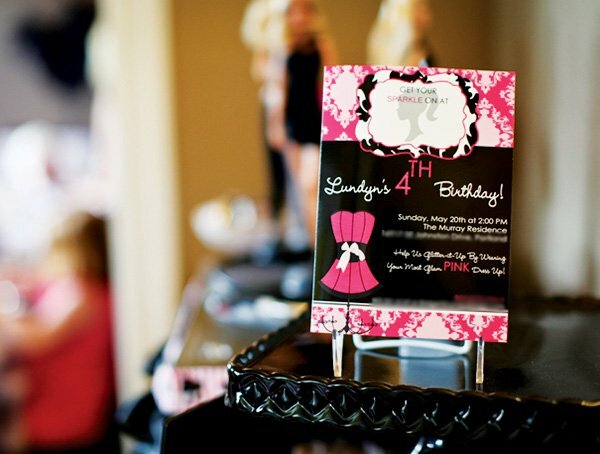 With this in mind, I created a paparazzi area by building a life size pink Barbie box replica. 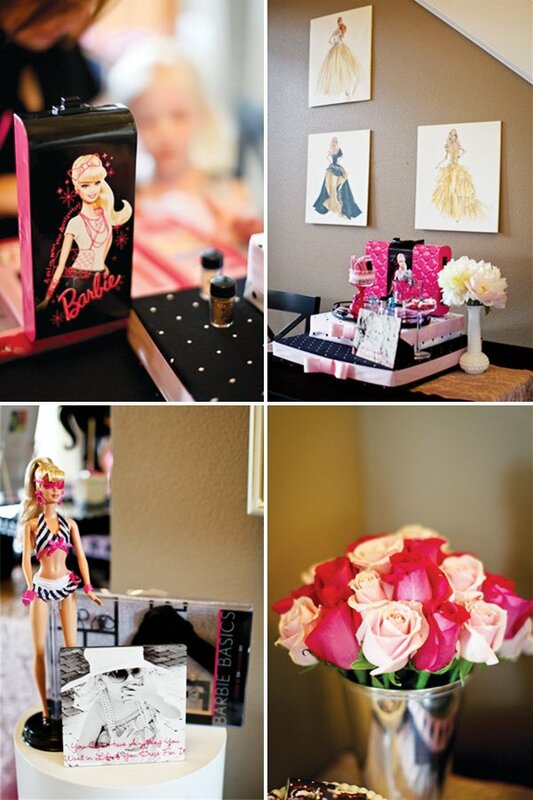 I painted it Barbie pink and then I placed a black chandelier sticker inside of the box to create a background. I designed a Barbie and Mattel sticker and placed them on the front of the box, making it even more like the Barbie boxes you see in the stores. 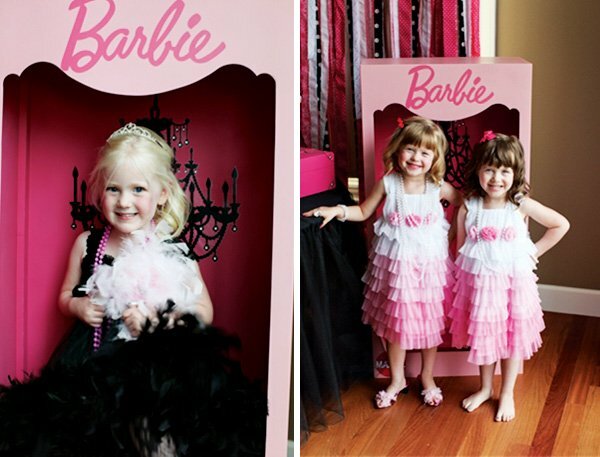 This was a great feature at the party, all the little guests loved standing in the Barbie box and having their pictures taken! 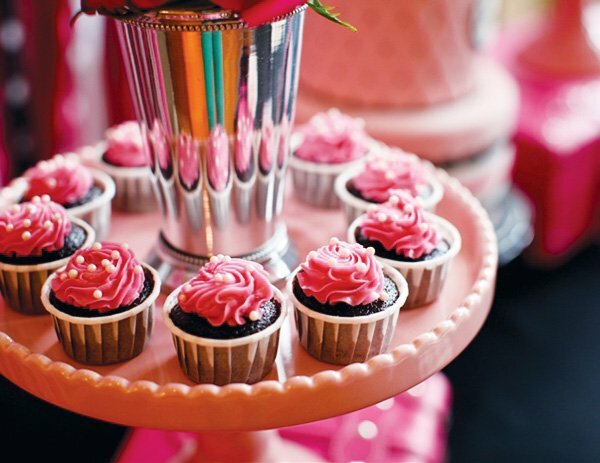 Who doesn’t love sweets? 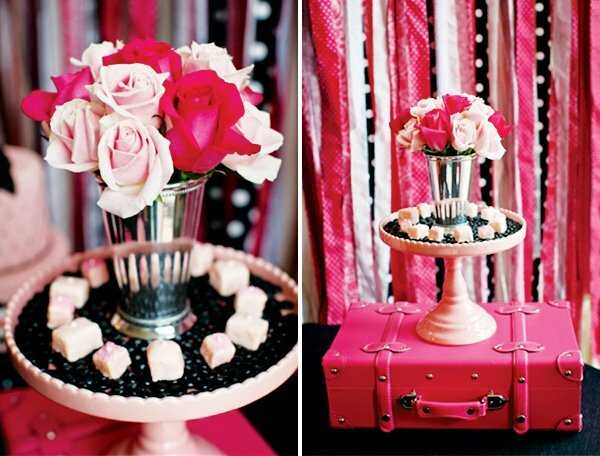 I created a sweets table that was covered with a black tutu tablecloth and a backdrop made from pink, black and white fabric and lace pieces. 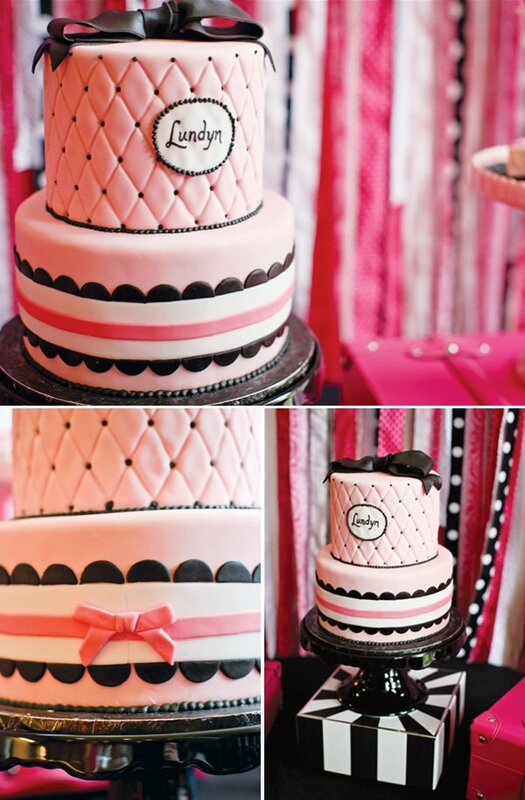 On the table were adorable Barbie themed cookies, a gorgeous two-tiered cake, cupcakes, full size candy bars with custom Barbie labels and grape and raspberry lip gloss that the birthday girl made herself for all her party guests! 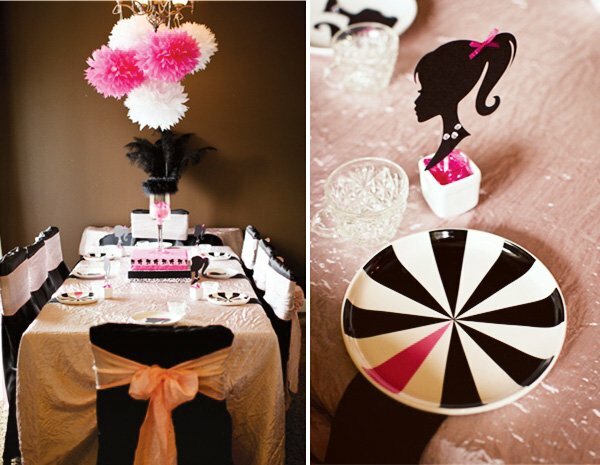 The lunch table was draped in pink and black fabric, and the chairs were covered in black satin and tied with crushed pink sashes. 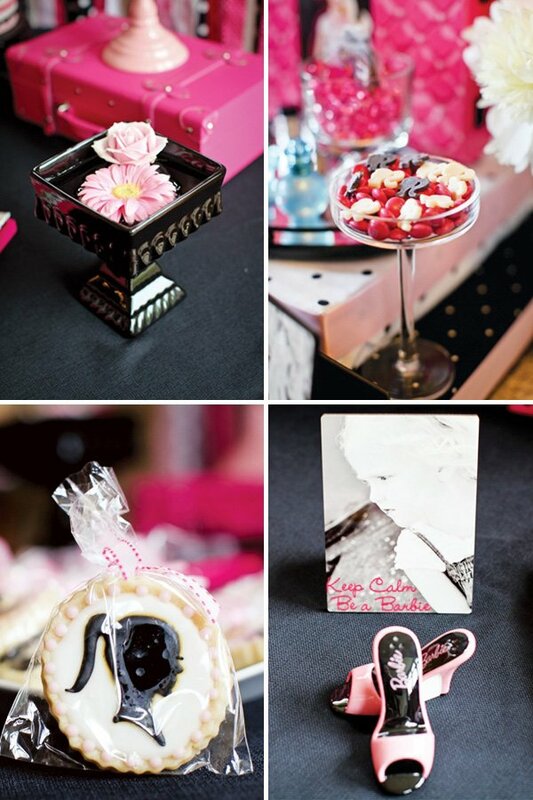 Each place setting included a Barbie silhouette for the guests to take home with them. 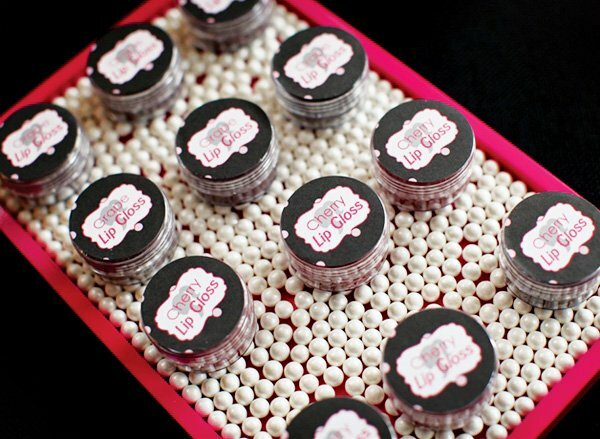 The party favors were housed in the Barbie house and each guest received a custom made Barbie tutu tote filled with glamour goodies and sweets to take home with them. 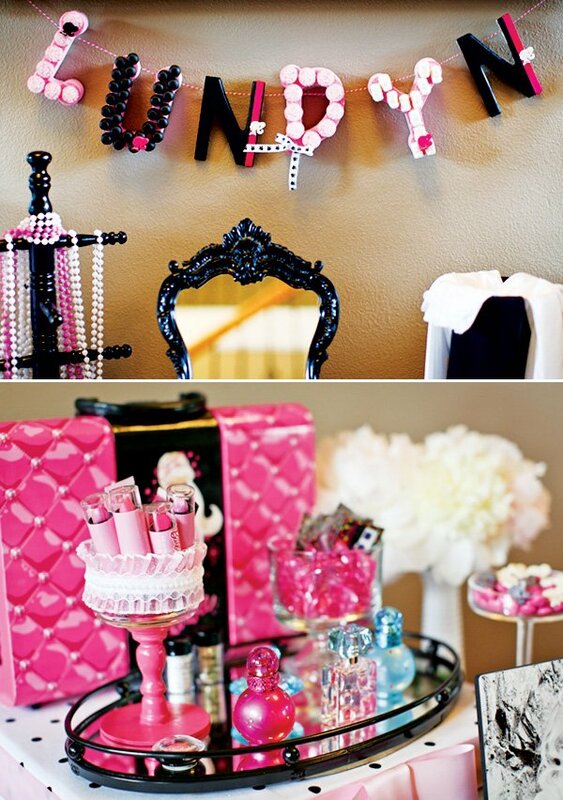 So cute, my daughter would love one of these Barbie themed parties. Wow! 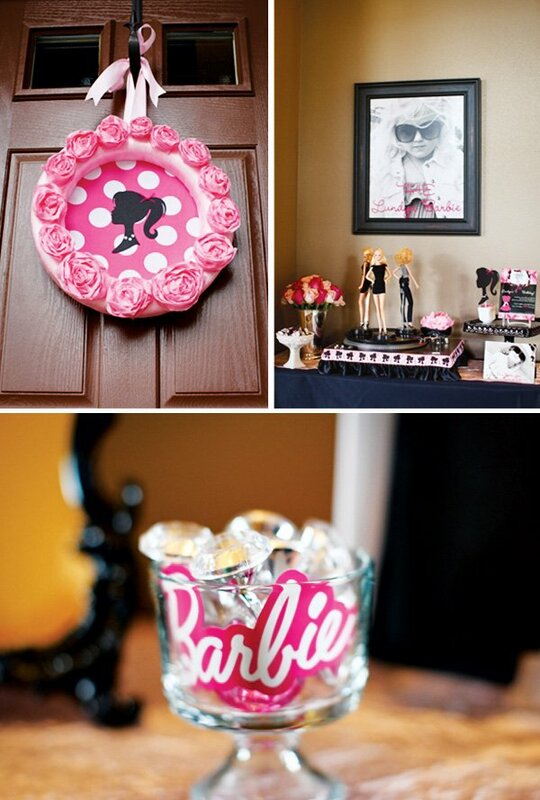 So impressed by your Barbie party decor and planning. 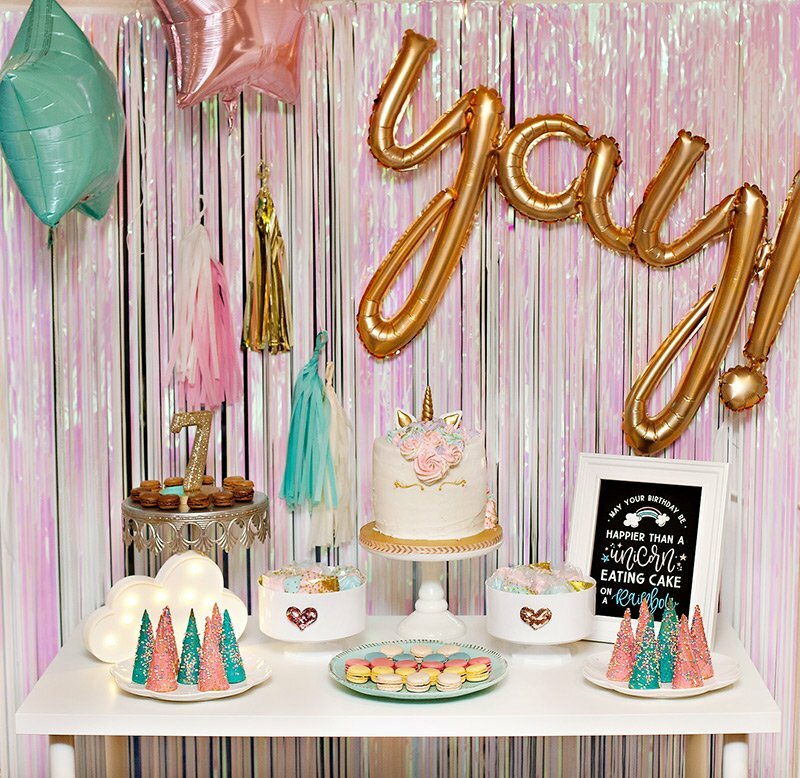 I have an almost 8 year old who is still into barbies (she recently told me that princesses are OUT but Barbies are still cool) and would just LOVE this party. I will be checking back often! 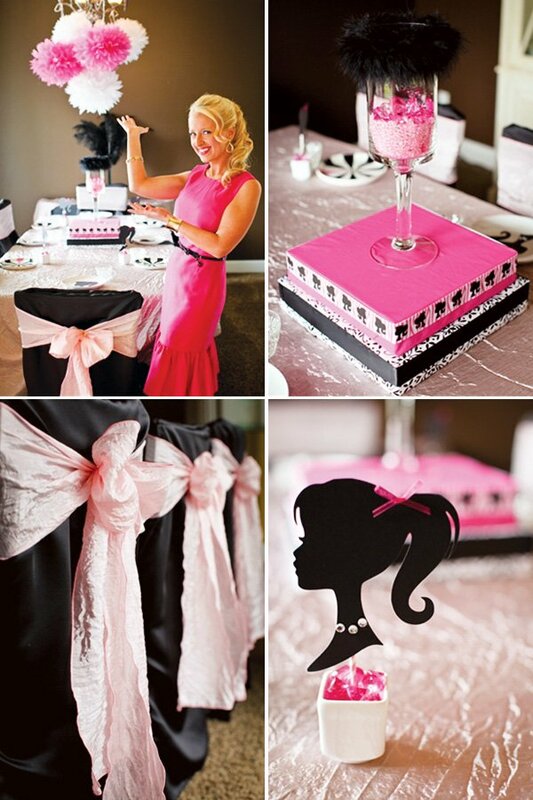 Barbie is one of my favorite party themes and this one is just absolutely spectacular! 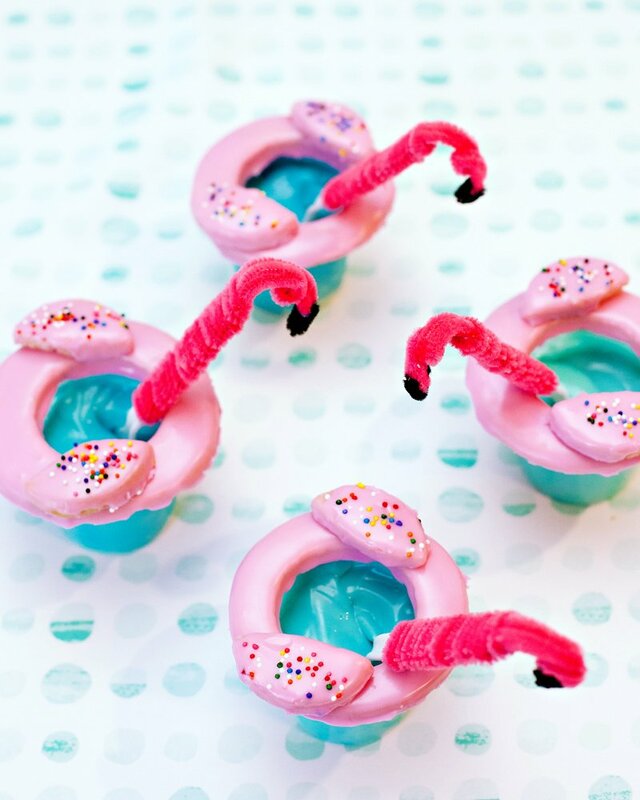 Great theme!! 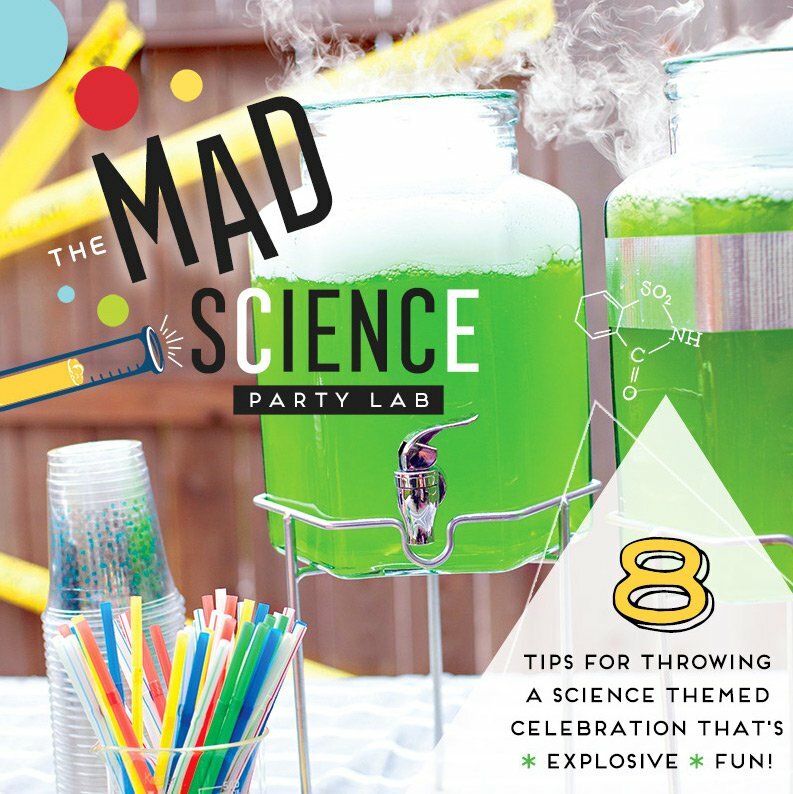 I would love to have the same themed party for my daughter. 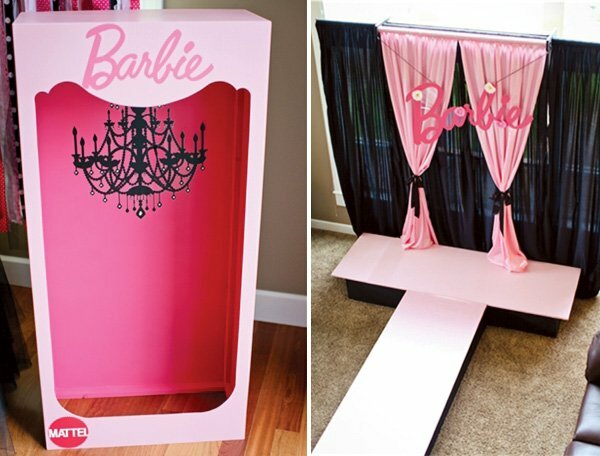 Oh my daughter would love this! Great photo booth! Where did you get the Barbie Font and Mattel? Amazing, amazing job!! 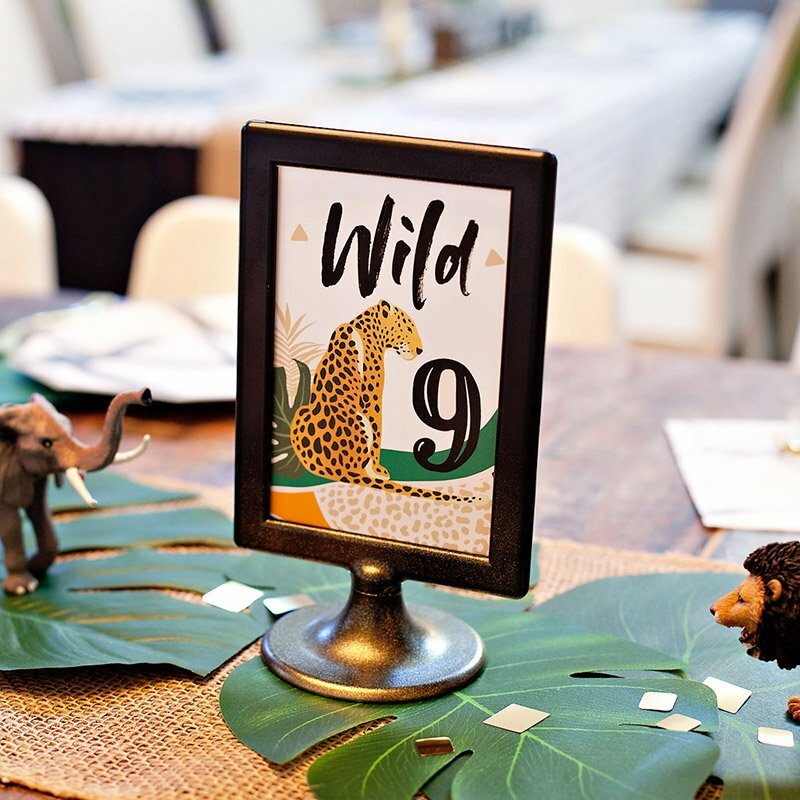 I put a lot of detail into my daughter’s parties and I am not easily impressed because I know all of the work that goes into details. This rocks!!! 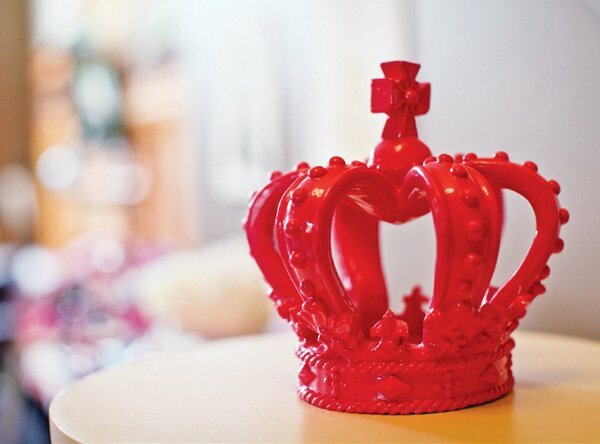 I love, love, love it – ALL of it!! OMG! I need a a life size box like that! How can I find, rent, or make one?